Programs vary weekly. Residents also have opportunities for outings (shopping, restaurants, events, etc.). Independent activity supplies are always available. Thank you! All of you at Briarwood created a wonderful home for my mom for 14 years in an independent apartment, then 4 years in Knollwood Nursing Center. Seamless, attentive care! 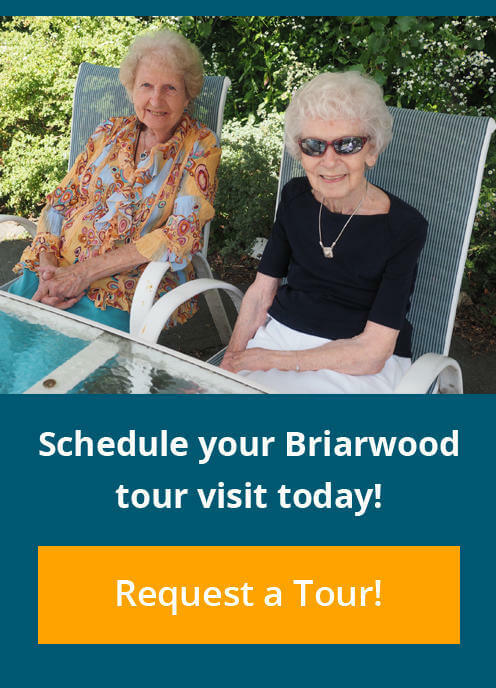 I am so grateful to Briarwood – truly a continuing care community! I have been at Briarwood for one year. It is the BEST move I could have ever made. The staff and the residents have been warm, friendly and helpful. I would highly recommend Briarwood to others! We looked at close to 13 communities to determine what we liked and what we didn’t. Briarwood has neighborhood settings with personal gardens and walking paths, cultural & educational opportunities, local museums & theater with transportation to the door, a world of music within this city, 10 minutes to world-class medical care, a continuum of care on the same campus, friendship and social activities that brighten the days and the spirits, and a warm, communicative, responsive and efficient staff….we said YES to Briarwood! I have lived here for ten years. I have never regretted my decision to come here. Folks are so friendly and we feel like a family. There is a lot of maintenance needed to stay in one’s own home – and I don’t have to worry about any of it! What do I like about Briarwood? What a simple question! I really, truly like everything. I loved my cottage, but now IÂ´m so happy in my cozy apartment. The meals are great and so graciously served. All the amenities are wonderful too. And best of all are the people, the staff and the residents. I feel so lucky to be here!!! One of many reasons I find Briarwood so pleasant, having lived in Worcester for most of my life, is meeting people I´ve known through the years. In conversation at dinner with someone I will often find that we have mutual friends or acquaintances.